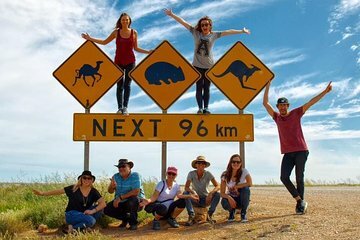 Travel across Australia's Nullarbor Plain on this 9-day tour from Perth to Adelaide—a one-way road trip that gives you the chance to see a piece of Australia that most visitors (and even residents) will never experience. You'll spend eight nights sleeping under the stars on a swag camping adventure, plus look for Aussie wildlife and admire the remote, arid environment. Adelaide, preferably in front of the YHA, 135 Waymouth Street. Other Drop-off's possible, upon availability with the tour operator/ tour guide. Please note in Special Requirements to request. This is an active tour and a reasonable level of fitness is required.